Government of India notified the OROP scheme vide order dated 7th November 2015 delineating the principles of OROP scheme and the implementation process. This was followed by detail order on CROP scheme dated 3rd February 2016 enclosing 101 tables of revised benefits under the scheme, which were made available to various categories of Defence forces pensioners and family pensioners. A circular was also immediately issued on 4th February 2016 to all pension disbursing authorities containing detail instructions for making revised payments under the scheme. 2. The Defence Accounts Department was closely associated with the OROP scheme and undertook the following activities in the entire process-Collection, collation and presentation of variety of data and records of Defence pensioners for working out the financial implications. Assisting the DESW/ MOD and PMO in finalizing the principles for rolling out the CROP scheme. Working out more than 100 tables of various categories of pensioners revising the rates of pensions under OROP and formulation of government letter on the OROP. Issue of detailed payment instructions to all payment authorities for time bound payments. Initiating a dialogue with Banks who account for 75% Defence pension disbursements and closely monitoring release of payments well before the prescribed timelines. 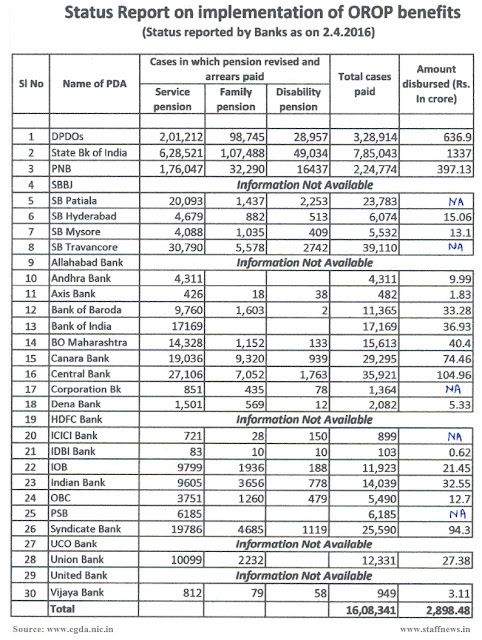 The DPDOs became the first disbursing agency to have credited the revised benefits under OROP in a record time to the accounts of 2,21,205 Defence pensioners on 29th February 2016 amounting to Rs. 354 crores. 3. All the offices dealing with pension matters right from PCDA(P), PCDA (Navy), CDA/JCDA(AF), CDA (PD), CDA Chennai, the Aashraya team and the DPDOS rose to the occasion and carried out the tasks assigned to them in the most professional manner and well within the times-lines so prescribed. The agencies in the department worked as a well-knit team in a collaborative effort. 4. Another first was the dialogue, which was initiated with all the Public Sector Banks in advance taking them on board in the massive exercise of ensuring that time bound payments are made to lakhs of Defence pensioners. The mandate could be achieved successfully by advance planning, concerted follow up action and continuous dialogue with all stakeholders. The latest update on release of pension benefits under OROP is enclosed.